Keywords are an integral part of Legendary®. They bring about new mechanics and effects that change the landscape of the game. 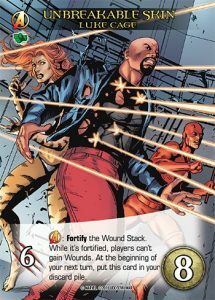 Legendary®: Civil War’s newest keyword Fortify has the ability to really mess with the players and the board. 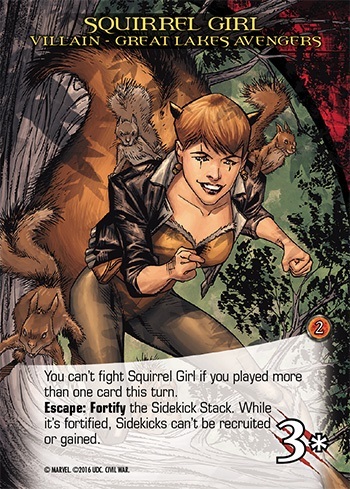 Fan favorite Squirrel Girl is just one of the fun new cards players have to contend with. Fortify represents Villains setting up traps for the players. When the keyword resolves the Villain is placed on or near the specified place. While it’s there, it has the listed effect. Any player can fight that Villain as normal to end that Fortify effect and put that Villain in their Victory Pile. …or even pester the players directly. If a card would fortify a place, don’t do anything if there is already a villain fortifying that place. Villains aren’t the only ones to get into the action. 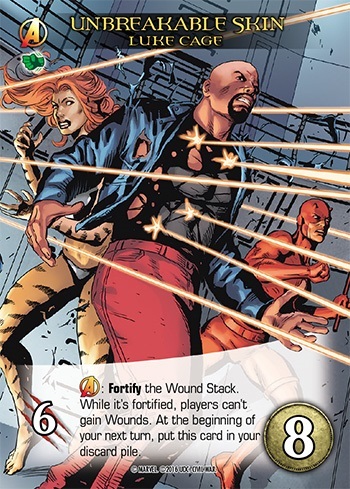 Heroes like Luke Cage can also use Fortify to help win the battle. Legendary®: Civil War releases this summer. Contact your local gaming store to preorder your copy today. This shows that very few ppl played the FF4 expansion set. Focus is THE BEST, by far. Yeah well I think very few people have an extra $200 lying around for a 100 card expansion. Negative – I have the FF4 set and yes, Focus is good. In fact, I might vote it 2nd, but Artifact (particularly the plain Artifacts) are even better (see GOT set). 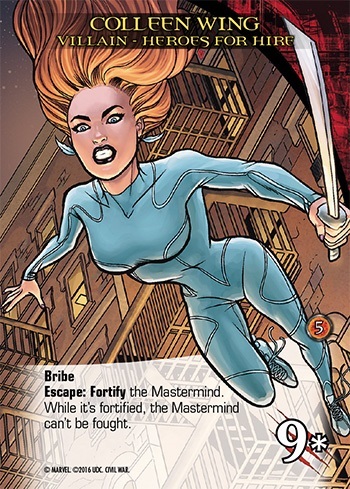 They can kick your fighting and recruiting power waaaaaayyy up, particularly helpful when fighting a difficult mastermind. However, I do agree- Focus was great, but I’m hoping for a thrown Vibranium shield, Mjolnir, or even a Pym Particle object that temporarily increases strength of heroes or diminishes strength of villains. I’ve been playing Legendary since the core set was released and have every expansion since then, IMO The ranking in the poll accurately reflects the “awesomeness” of the keywords. Artifact>Versatile>Focus. When a villian with Ambush : Fortify enters the city, immediately moves to the correct place to fortify it ? Im right ? “When the keyword resolves the Villain is placed on or near the specified place” . The same when he escape ? Yes. 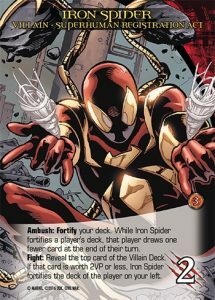 An Ambush or Escape effect with Fortify would move that villain to it’s required spot. Sorry if I’m being thick here but that Squirrel Girl card confuses me. I’ve always played that you play all your cards each hand and create a ‘pool’ of attack and recruit. Is this card saying that I can only play one of my cards the turn I want to fight Squirrel Girl (With a 3 attack minimum) and I discard the rest? In Legendary, each card from your hand is played and resolved one at a time. Each card that has Attack or Recruit has those points added to your ‘pool’. Squirrel Girl says that in order to fight her you can only have played one card and have enough attack to take her down.